Alice (Adrienne King), the survivor of the murders at Camp Crystal Lake suffers a grizzly fate in her own house. Some five years later, The original camp is still closed down but a new camp will be opening nearby. A group of teenagers arrive for counselor training, led by Paul (John Furey) and Ginny (Amy Steel). Despite warnings about what happened at the now abandoned Camp Crystal Lake, some of the kids decide to go take a look. They get caught by the local sheriff, but they attract the attention of whoever or whatever is lurking there. Friday the 13th part 2 feels much more like what most people think of when they think of the series as a whole. Jason appears sans iconic hockey mask but with a much more frightening sack on his head. He's still not the unstoppable force he'll become later, instead he uses a lot more misdirection and stealth which actually makes him more interesting a antagonist. The look of the film is slightly more polished that it's predecessor, but not so much it totally looses it's gritty texture. There is also a bit more humor in this film, and while it's not great comedy, it does help provide a little more contrast compared to the wall-to-wall grimness of the previous entry. 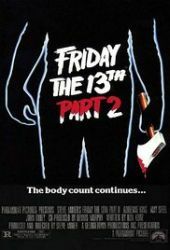 Standing on it's own, Friday the 13thpart 2 is a very competent if not overly spectacular slasher film. As part of the series, It lays down most of the groundwork, and does an admiral job of it.